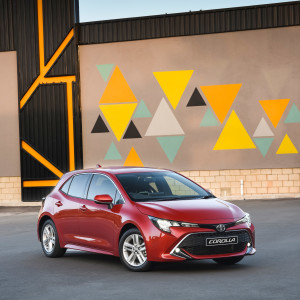 Drove the All New Corolla hatch recently, one of Toyota’s most successful models, and previously named the Auris, it makes it’s return to the hatch segment. A lot of buyer’s in SA prefer the hatch to the sedan, so it will fit in well to the segment. And so far, at the launch it showed off with it’s looks, driving dynamics & styling. 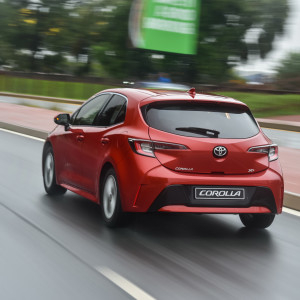 Built on the Toyota New Global Architecture (TNGA) chassis as its basis, the Corolla is longer, lower and therefore sleeker than its Auris predecessor. It has a striking front look, with it’s new trapezoidal lower grille, with a new mesh design, coupled with the narrow upper grille, LED-lamp clusters, and daytime running lights, situated on the clam-shell bonnet. This gives the Corolla width, and emphasizes the aggressive, bold new stance. The rear look is more rounded now, and it looks more compact due to the styling of it’s rear windscreen angle. The LED light clusters situated as far to the left and right as possible, give width, and all versions of the hatchback feature a roof spoiler and shark fin antenna. It includes three new colours – Scarlet Metallic (Red), Oxide Bronze and Caribbean Blue. Following in the footsteps of the C-HR, which has led the way with acclaimed interior styling, the Corolla pulls out all the stops. 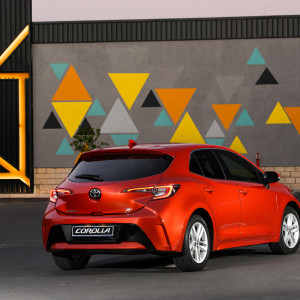 It has an array of new textures, colours and trims, which all combine to give the Corolla a great look. It has a lovely slim instrument panel, that allow better visibility, and the cockpit has a wrap around feel that is very driver focused. Seats are very comfy, and when cornering you feel snug. All rear seats can be folded to give a flat load space if needed. The rear space is fairly roomy and the boot is average size. 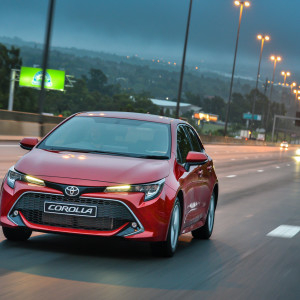 The Corolla handles very well, and that is due to the TNGA platform mentioned earlier, which is the cornerstone of all Toyota’s future powertrainand vehicle development. It is far more dynamic and seems more assured in the corners. It also helps that is more planted and aero-dynamic. It has multilink rear suspension which does not intrude on the loadspace, actually allowing increased load volume. Ride comfort is more quiet and notably smoother. 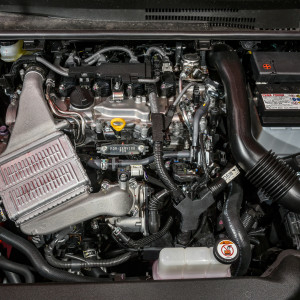 The powertrain is a 1.2-litre four-cylinder turbopetrol engine that delivers 85kW and a constant torque curve of 185 Nm between 1,500 and 4,000 rpm through either a 6-speed manual or a new 10-speed Sport Sequential Shiftmatic Continiously Variable Transmission (CVT). We often do not enjoy CVT transmissions, as they whine and hunt for gears constantly. This one is a lot better. The engine, which is also in the C-HR, is good for a 0 to 100km/h in 9.5 secs, which is not bad for a standard hatch, with a nifty top speed of 200 km/h (190 for CVT). 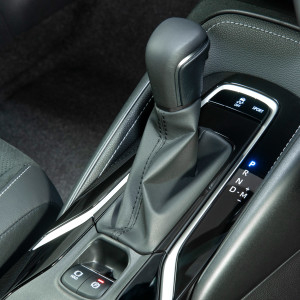 Fuel consumption has been pegged at 6.1 litres per 100km for both manual and CVT variants. 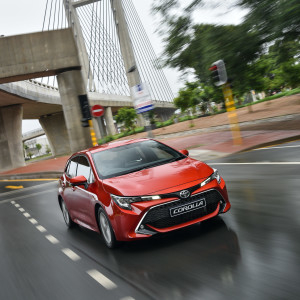 In summing up, the Corolla has a lot going for it, but it is in a hotly contested segment, that includes it’s very strong opposition the VW Polo, and the Ford Figo and Fiesta. So time will tell if it makes as big an impact as it would have done in years gone by. By and large, most motor manufacturers have strong models that offer good value propositions.